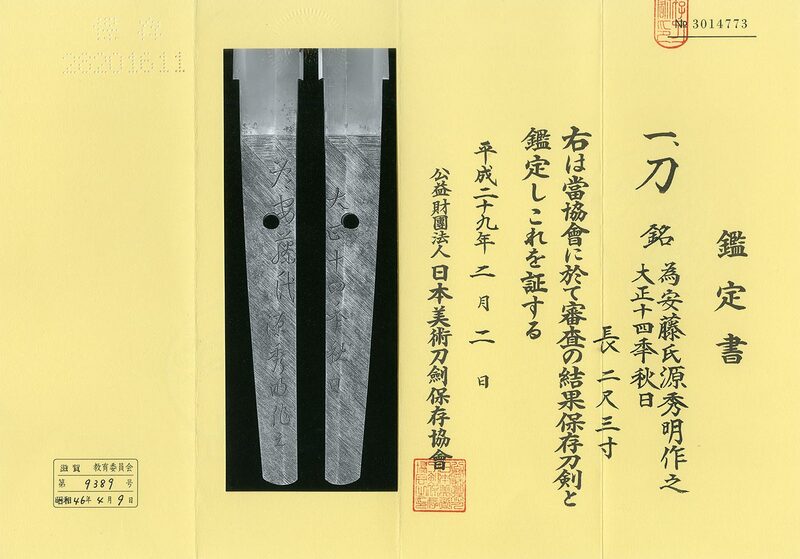 EXPLANATION: This sword was made by Hori Toshihide (Minamoto Hideaki) in Autmn 1925, custom order by Mr. Ando. Blade length(nagasa) :　69.9cm or 27.51 inches. Width at the hamachi : 3.16 cm or 1.24 inches. Width at the Kissaki : 1.97cm or 0.77 inches. Kasane : 0.71cm or 0.27 inches. Era : Taisho era. 1925.
with suitable sori and long kissaki. it is easy to look the Jigane. Yo and ashi are very soft habuchi like morning mist. Horii Taneaki in 1904 and succeeded the Horii School as the Third. Toshihide used three names: Hideaki, Kaneaki and Toshihide. a famous steelmaking company at Muroran City. in the prewar Japan. He passed away in 1943 during the Second World War. by die of a brain tumor on the half way. Imperial Household in order to imperial donation. He also made sword for Togo Heihachiro and achieve high evaluation. Tsuba : Mokko shape iron Tsuba, two circles are engraved with open work. Menuki : Flower is engraved. the tytle of Hideaki’s name which was received from Suishinshi Masahide. The sword is big different from the regular Hideaki. Katana : Hoki Kuni Nawa Ju Hayashi Nagataka 78 Sai Saku Kore.